Côte d'Ivoire is the world's largest producer of cocoa (the second largest is Ghana and the third largest is Indonesia). Cocoa Life has been active in Côte d'Ivoire since 2013. Here, 23,041 farmers participate in Cocoa Life, across 433 communities. "Farmers need updated skills and access to inputs, including fertilizers and pesticides to be able to produce more and better. We believe that through the Cocoa Life program we will improve community empowerment. We need to change farmer’s conception that they cannot develop themselves without external support." This dashboard demonstrates the scale achieved by the end of 2017 and how Cocoa Life is making progress in Côte d’Ivoire. Cocoa Life monitors the below output indicators under five focus areas. These are interventions we put in place with our partners. 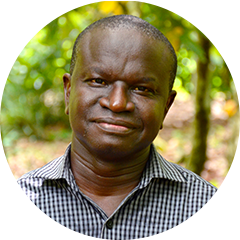 "Through Cocoa Life, We Are Able To Expand Our Knowledge About New Farming Techniques And Learn To Master Good Agricultural Practices."